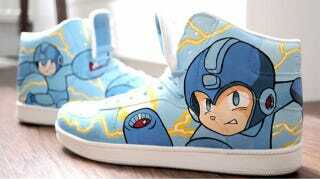 This pair of Mega Man sneakers is equally cute and awesome. This pair of Mega Man sneakers is equally cute and awesome. Created by Bobsmade.com, it is just one in a long line of equally great-looking custom-made shoes—you can check out the others on the website.